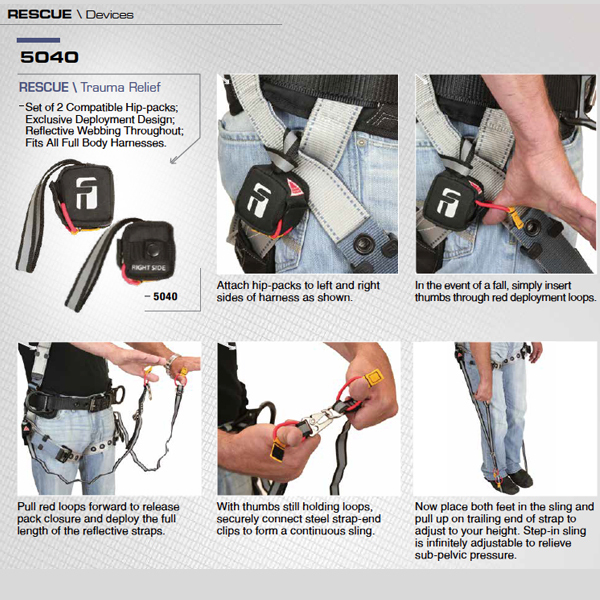 Attach hip-packs to left and right sides of harness as shown. In the event of a fall, simply insert thumbs through red deployment loops. Pull red loops forward to release pack closure and deploy the full length of the reflective straps. With thumbs still holding loops, securely connect steel strap-end clips to form a continuous sling. Now place both feet in the sling and pull up on trailing end of strap to adjust to your height. Step-in sling is infinitely adjustable to relieve sub-pelvic pressure.